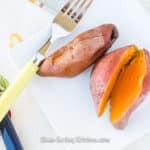 Here’s how to make sweet potatoes in the Instant Pot. Wash the sweet potatoes, using a sponge or brush to scrape off any pieces of dirt. Pat dry with a clean towel. Place the trivet into the bottom of the Instant Pot. Add the water. Arrange the sweet potato on the trivet. When the cooking time is complete, let the pressure come down naturally for 5 minutes, and then quick release the remaining pressure. Remove the lid and use tongs to transfer the cooked sweet potatoes to a serving plate. Use immediately, or cover and refrigerate for up to 5 days. Note: cooking times can vary based on the size of your sweet potato. Medium is the most common size. The small ones fit in the palm of your hand and the large ones are huge.